Outside the Rat Race: Mortgage Payments Once A Month Or Every Other Week? Mortgage Payments Once A Month Or Every Other Week? 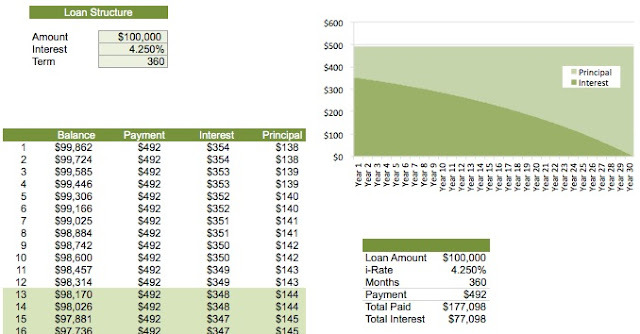 Last year I shared my DIY Loan calculator. It came in pretty handy for myself today because I was talking with a friend about the benefits of making half a mortgage payments every other week instead of the full amount once a month. The amount of interest calculated on the balance is technically smaller because it gets cut down just a little bit mid way through the month. Yes it's small, but it does add up over 30 years. A couple times during the year there are 5 weeks in the month. This means that at the end of the year you actually end up making 1 extra payment (26 half payments = 13 full payments). This dramatically reduces your principle. You really need to plan your funds carefully to be ready for when those 2 extra payments happen. It's not impossible, you just need to be ready for it. You also need to make sure you can actually afford the extra payments. The other disadvantage, especially for investment property, is that this reduces the cash-flow on your property. In the long-run (25 years later), it'll make a big difference, but you pay for it up front. When you first buy a building, there are often other repairs that need to happen too, so that money may be better spent elsewhere. I was able to use my little calculator to figure out how much I would save. It is significant (~$30,000), and I'll pay off this property 5 years sooner, at which point the cash-flow becomes REALLY nice. The big question is whether I can afford it, and if the money would be better spent elsewhere. I think my plan is to take that extra payment, divide it by 12, and put it into an ING savings account each month. Then, at the end of the year I can decide if I want to make a big dent on my principle, or use it somewhere else. Given my current low interest rate, I suspect I'll find other uses for it, especially since I own a new Jeep, but I'll withhold judgement for now.